I HATE the beds in our house. They are stupidly designed. They have this stupidly placed 2 inch lip completely around the bed. And, it is at just the right place that you (well, I) constantly smack your shins into them...and always at full speed....this causing way too much pain! Then there is the fact that our landlord originally told us she would take the bed out of Connor's room only to change her mind once we moved in. So, we are stuck with a room with way too much furniture, a person who is overly accident prone (me) and two shins who have been beat beyond recognition. BOTH shins in one week! That's just not nice! You can't tell from the picture (some great quality ones from my iphone!) 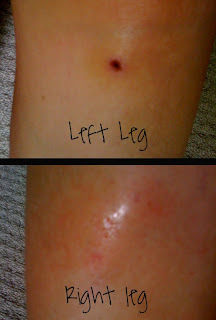 but my right shin is all swollen and it hurt oh-so-bad when I was showering today.